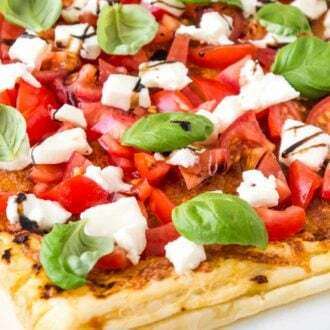 Tomato Mozzarella Puff Pastry Pizza is super easy and fast to make! Buttery puff pastry brushed with pesto, baked to a golden brown and then topped with fresh tomatoes, mozzarella, and basil. 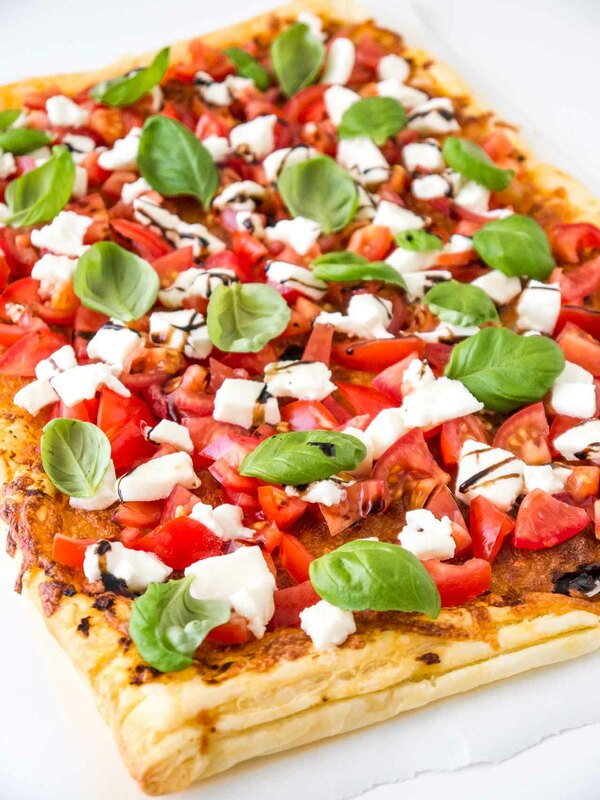 Prepare the most delicious puff pastry pizza in just 30 minutes! Tomato Mozzarella Puff Pastry Pizza makes a great weeknight dinner but is also perfect for a party! I really love Italian food, especially Insalata Caprese which is like the Italian flag in food form: green basil leaves, white mozzarella cheese, and red tomatoes. 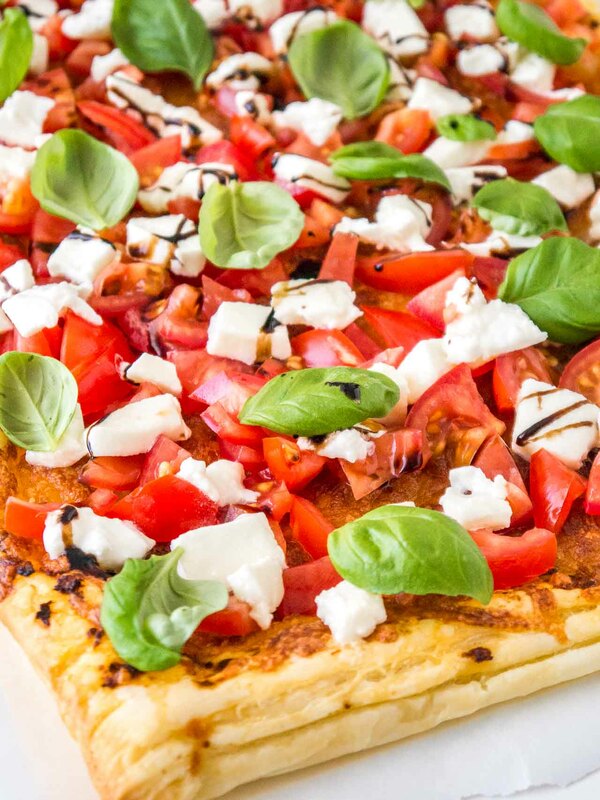 This Flatbread Caprese Pizza is the perfect combination of two of my favorite foods: Caprese Salad and Pizza. Using puff pastry as the base saves you so much time. 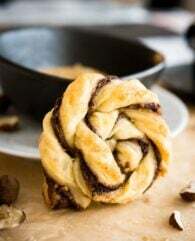 You don’t have to make a yeast dough which needs hours to be perfect and there is no kneading involved, just thaw a sheet of puff pastry in the fridge and you’re ready to go. Brush the puff pastry with pesto, bake it in the oven until crispy and then top it with fresh tomatoes, mozzarella cheese, and basil. 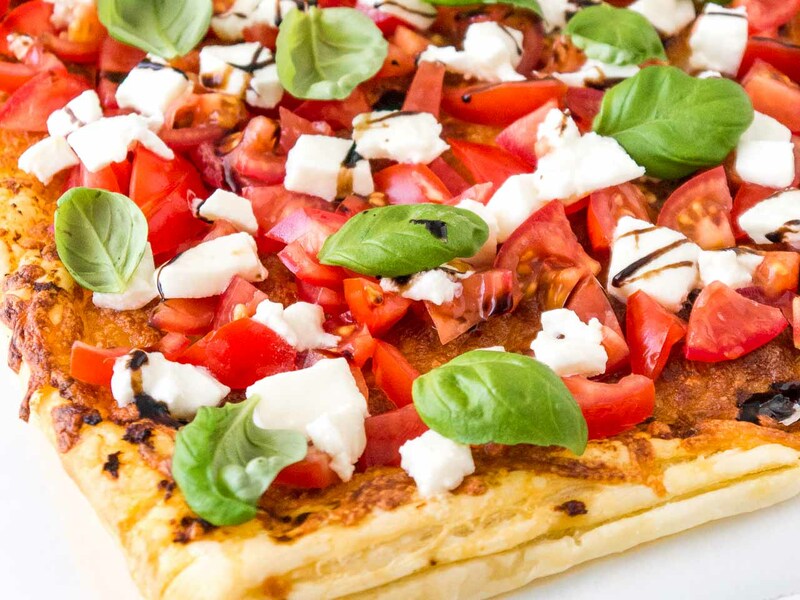 Drizzle a little bit of cream balsamico over the Caprese puff pastry pizza and you have a perfect party appetizer or tailgating snack that is bursting with fresh flavor! You can make homemade puff pastry or use frozen or refrigerated puff pastry sheets from the grocery store like I always do. I prefer the refrigerated puff pastry because I don’t have to remember to take it out of the freezer. 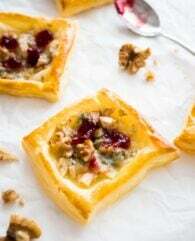 For this recipe, I used a 9×13 inch sheet of puff pastry. You could also make individual puff pastry pizzas. This Puff Pastry Pizza is brushed with pesto and topped with shredded cheese before baking but baked without the other toppings so the puff pastry gets crisp and flaky while baking in the oven. My friends and family love the combination of fresh ingredients and a flaky, buttery crust. It tastes similar to bruschetta which is one of my all-time favorite Italian appetizers! Core and deseed the tomatoes so that they don’t make the puff pastry crust soggy. I love to use mozzarella di Buffalo for this recipe because it is much more flavorful than normal mozzarella. You can use your favorite pesto for this recipe. Looking for more puff pastry appetizers or snacks? Pesto: I love the all the pestos from this brand! Balsamic Glaze: This is one is my favorite, it has just the right sweetness to it and is great to drizzle over salads. Refrigerated Puff Pastry: This brand makes all kinds of refrigerated doughs like pizza, flatbread, and puff pastry. I prefer refrigerated puff pastry over frozen puff pastry. 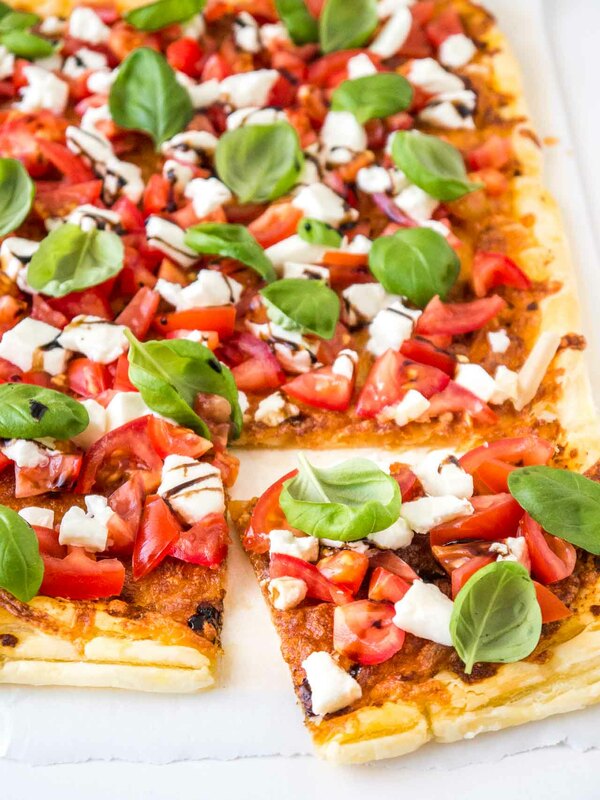 Tomato Mozzarella Puff Pastry Pizza is super easy and fast to make! Crisp pastry brushed with pesto and topped with fresh tomatoes, mozzarella, and basil. Roll out the puff pastry and transfer to a parchment lined baking sheet. Pierce it with a fork a few times to prevent bubbling. Brush the pastry evenly with pesto and top with shredded cheese. 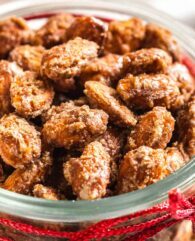 Bake for 16 minutes or until golden crisp around the edges. In the meantime seed, core and dice the tomatoes into 1/2 inch pieces. Dice the fresh mozzarella into small pieces. Remove the puff pastry from the oven and place the prepared tomatoes and mozzarella on top. Season with salt and pepper. Drizzle with balsamic glaze and top off with basil leaves - enjoy!